Happy Friday, everybody! 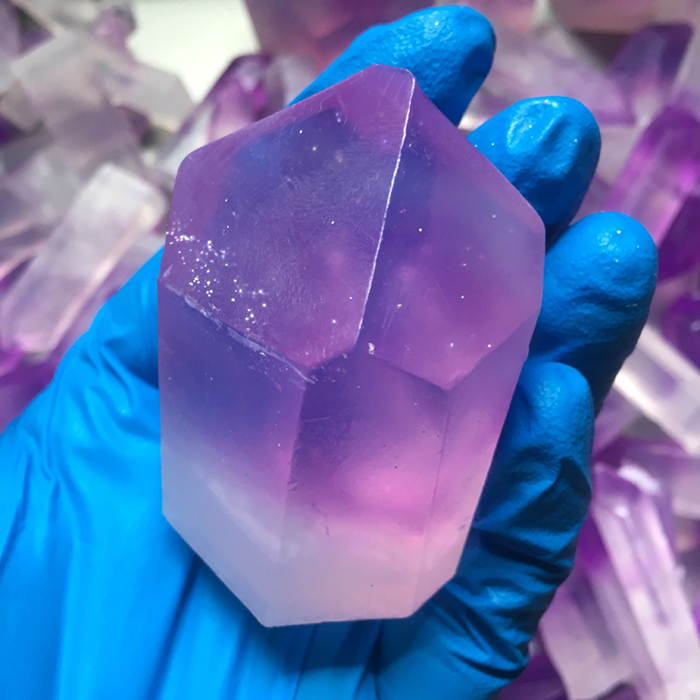 This is Lane (aka Mama Bass) from Mama Bass Handmade Soap, and I am going to teach you how to make Amethyst Crystal Soap Points out of clear melt and pour soap. I’m very excited to be given this opportunity to test out Bramble Berry’s new Amethyst Fragrance Oil and even create something cool for you guys to learn! 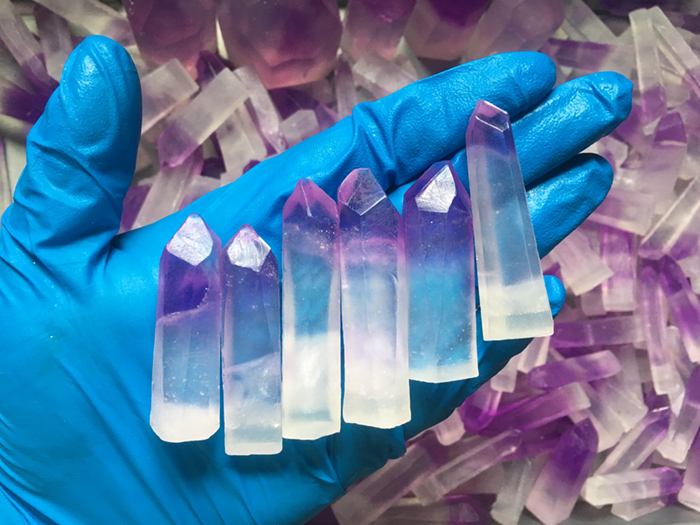 There are so many beautiful things that you can make with these Amethyst Crystal Soap Points. They are one of my absolute favorite things to make. I’m happy to show you how I make them, as well as another project to use the soap points in! I filmed the making of these projects, so there are videos along with step-by-step instructions. So without further hesitation, let’s get started! 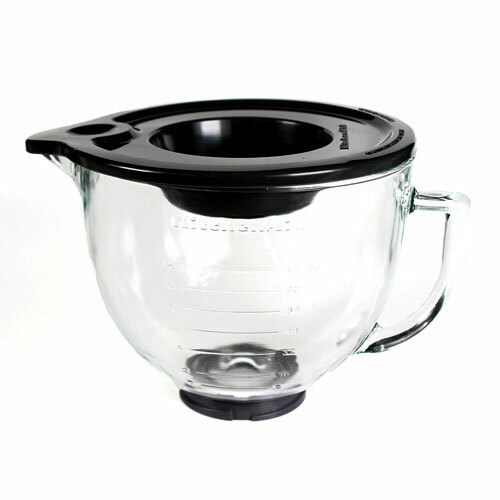 ONE: Cut up 50 ounces of Ultra Clear Soap Base and add it to the 5 Quart Mixing Bowl. Melt in the microwave using 30 second to 1 minute bursts as many times as needed until completely melted. TWO: Once the soap is completely melted, pour 16 ounces of the melted soap into a smaller measuring cup and set the rest of the soap aside. THREE: Using a dropper, add 3 drops of Tropical Purple LabColor to the 16 ounces of soap and stir until completely combined. NOTE: This is undiluted LabColor. We normally recommend diluting it, but Lane tested this recipe and found undiluted LabColors work best. If yours are diluted, you will need to add more to get the same color. FOUR: Add 12 mL of the Amethyst Fragrance Oil to the purple soap and stir until completely blended. FIVE: Pour most of the melted purple soap to the mold. 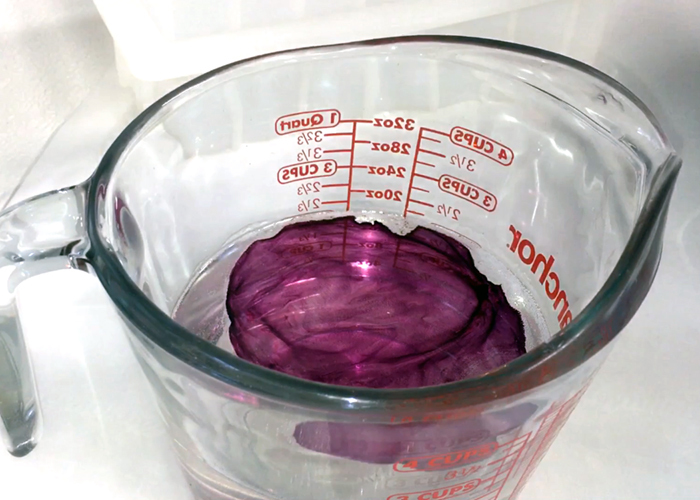 Reserve about 4-6 ounces in the container, and add 3 more drops of the Tropical Purple LabColor to the rest of the melted soap for a more vibrant purple color. SIX: Pour the rest of the dark purple soap into the lighter color purple already in the mold. 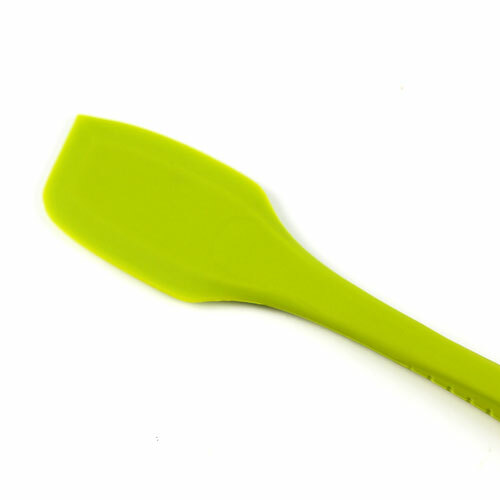 With a spoon or spatula, swirl the soap around a little bit. Spritz with alcohol to get rid of bubbles. SEVEN: Let the soap cool and harden until it forms a skin. 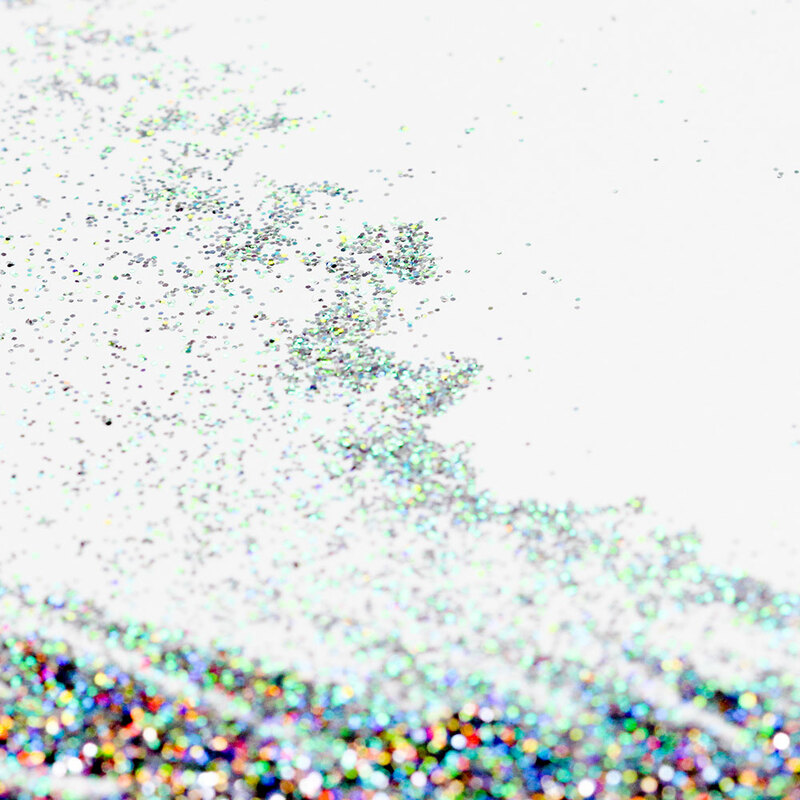 Then, dust on a fine sprinkling of Fine Silver Rainbow EcoGlitter on top. 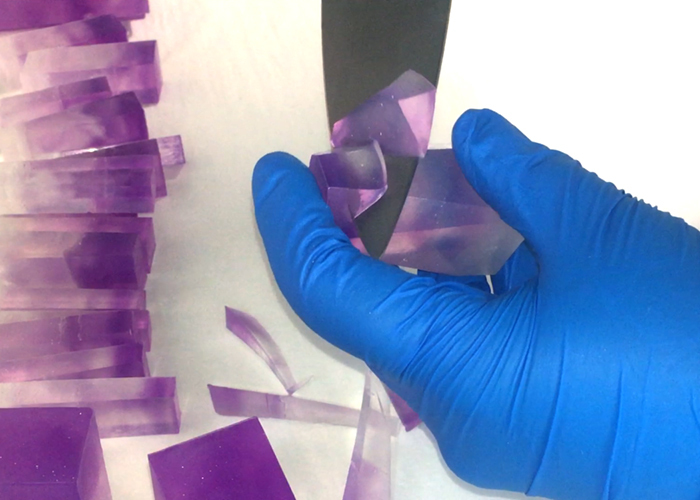 EIGHT: Add 18 mL of Amethyst Fragrance Oil to the remaining uncolored soap. Stir until fully incorporated. TEN: Once the soap is the correct temperature (see note), spritz the purple soap with alcohol. 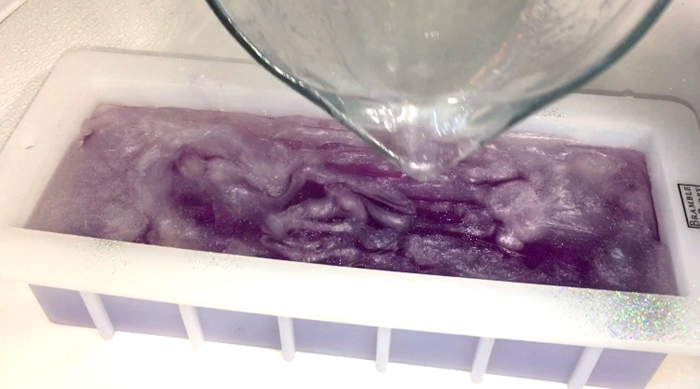 Pour some of the clear soap into the purple soap slowly. Reserve about 8 ounces of clear soap. Spritz with alcohol once more. NOTE: It’s very important at this point to keep track of temperatures. 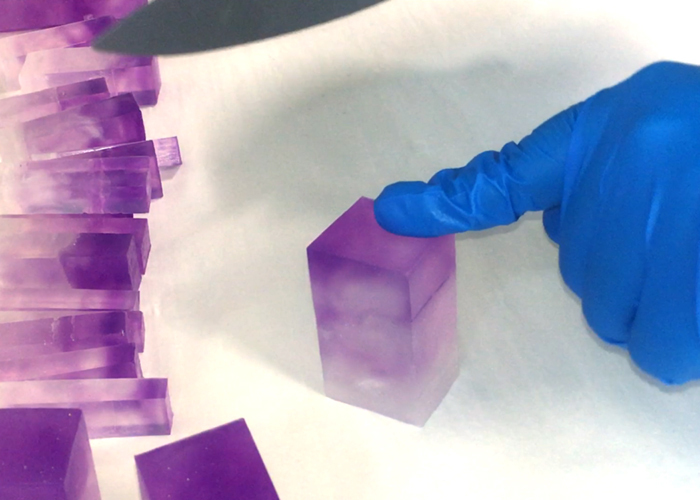 The idea is to have the clear soap warm enough to penetrate the purple soap that is already in the mold. The ideal temperature for the purple soap in the mold is around 120° F, and the ideal temperature for the clear soap in the bowl that you’re about to pour is around 135°. ELEVEN: At this point, the remaining soap may have cooled and hardened. If so, heat up the soap in the microwave again for 20-30 seconds to make it fluid. When it’s liquid again, add two .15 CC Mini Scoops of Super Pearly White Mica to the reserved clear melt and pour. TWELVE: Spritz the soap in the mold with alcohol again and carefully pour the white soap onto the clear soap in the mold. 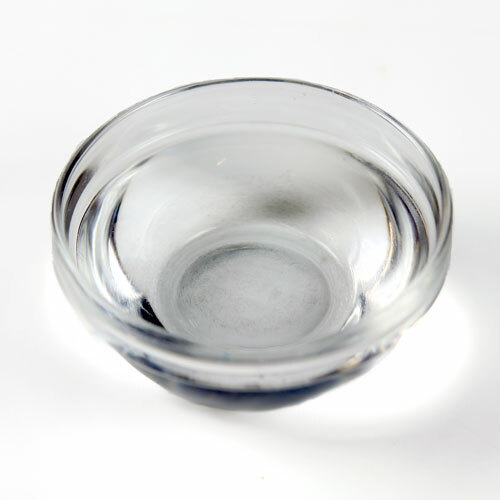 It will penetrate into the clear soap, so be mindful not to pour too high or too fast. 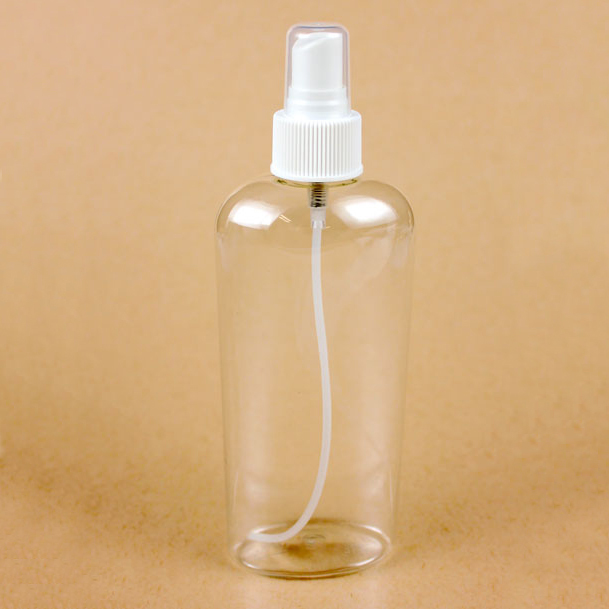 Spritz with alcohol to eliminate bubbles, and let completely dry and harden for several hours up to overnight. ONE: After the soap has completely hardened, it’s time to cut. Remove the soap from the mold. Carefully cut the loaf into bars the width you’d like to cut your crystal point. 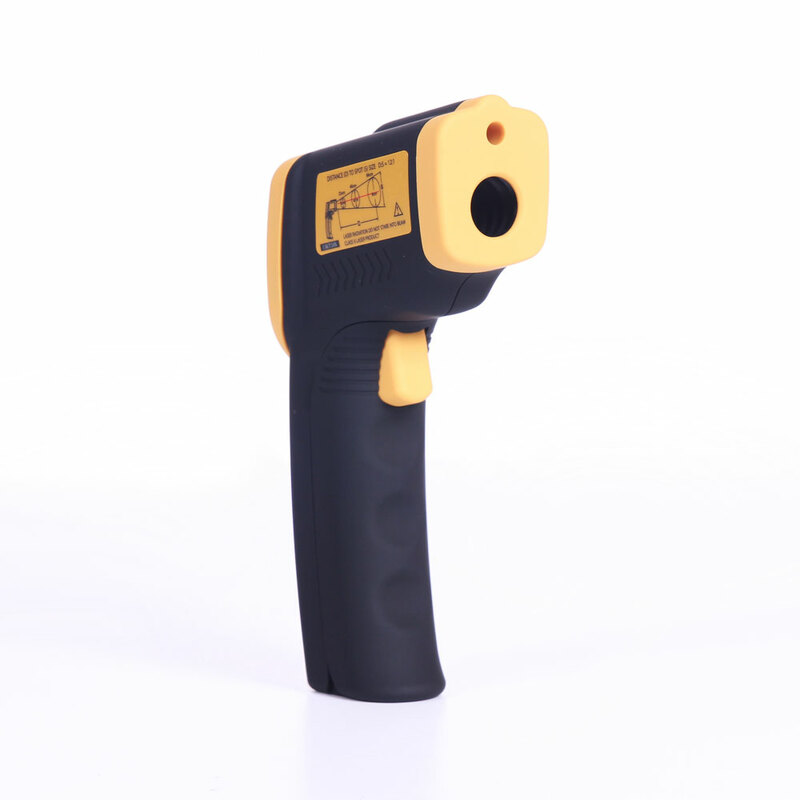 Vary the widths anywhere between .5″ and even up to 2″ (for large crystal points). Just give yourself variation for whatever size you decide. If you prefer large points, 1.5″ to 2″ slices work best. 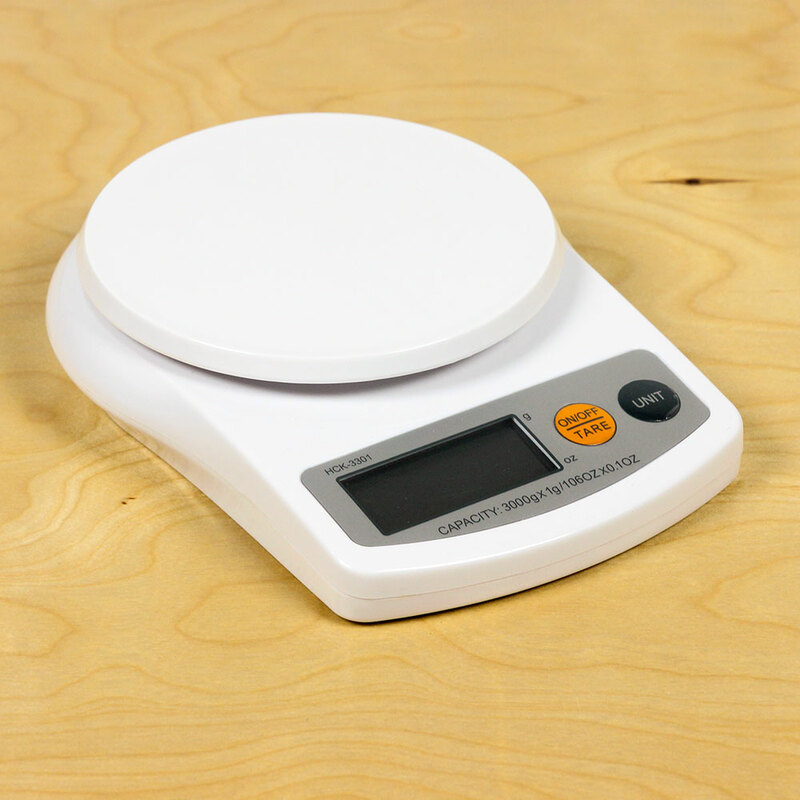 For the smaller points, create 0.5″ to 1″ slices. Sometimes I’ll even go as far as to slice a 0.5″ bar into a 0.25″ bar for teeny tiny crystal points. TIP: Please refer to the attached Amethyst Point cutting video to see the technique for cutting the points, I’ll try my best to explain in words, but it’s really a whole lot easier to understand when you see it! TWO: With the purple side up, slice the bar into even sections where the top edges look like a square. THREE: Very carefully, cut all four corners off of the section. FOUR: On the corners you cut off, place the knife upward and diagonal, about 2/3 of the way up the section of soap, and very carefully cut the soap into a crystal shape on all four top corners. FIVE: The soap should now look like like an amethyst crystal point. Do this repeatedly until all the bars are cut into into crystal point shapes! TIP: Keep the scraps and extra cuttings to use in later projects. 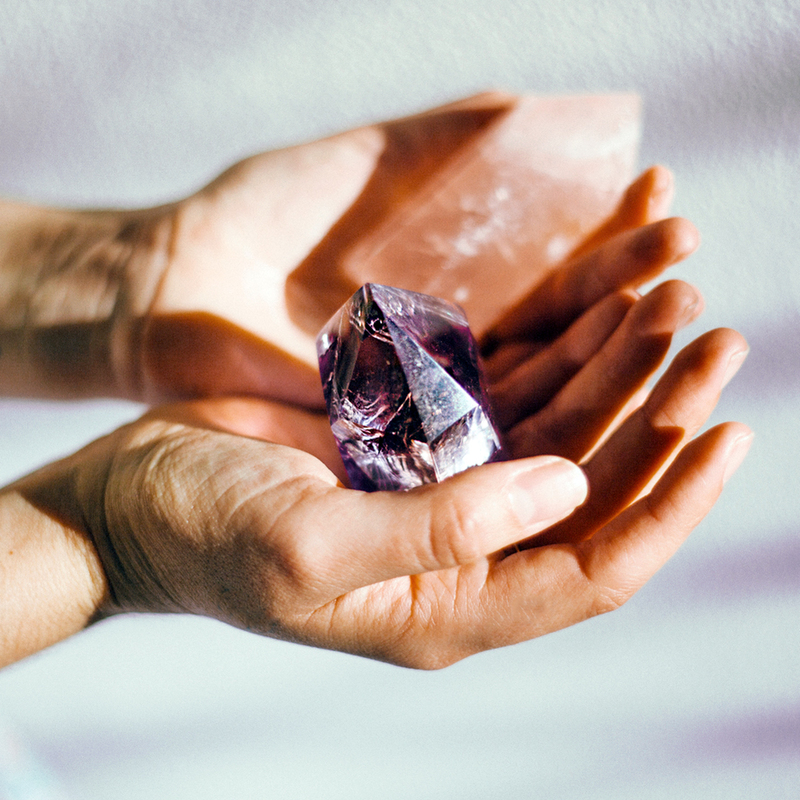 They look like little amethyst chips, so hold onto them! That’s it! I hope you enjoyed this tutorial and are inspired. I would love to see what you all create! Below is a video to show you how you can use these soap crystal points as embeds in another project. 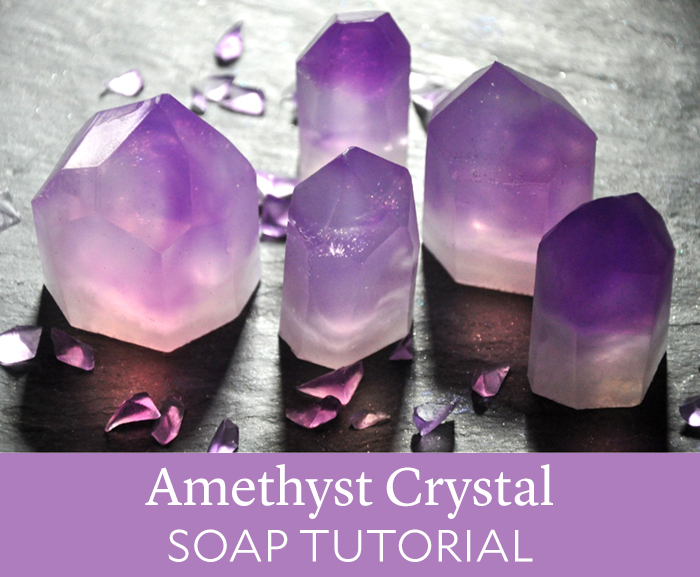 Lane with Mama Bass Handmade Soap shows you how to make Amethyst Crystal Soap Points. Once the soap is completely melted, pour 16 ounces of the melted soap into a smaller measuring cup and set the rest of the soap aside. TIP: Pre-warm the measuring cup in the microwave for about 30 seconds so the soap doesn’t cool drastically when transferred. 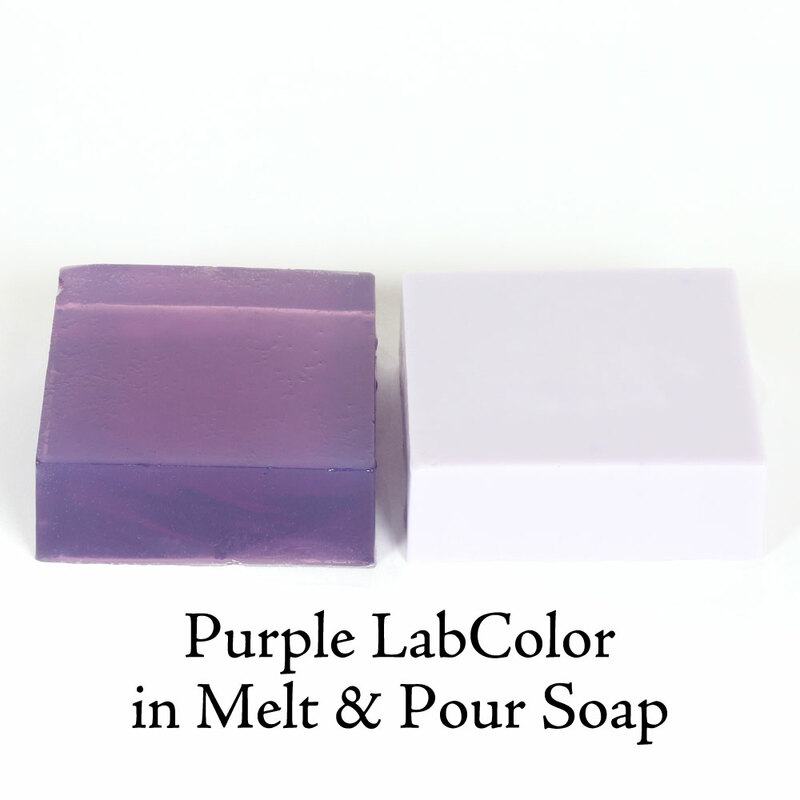 Using a dropper, add 3 drops of Tropical Purple LabColor to the 16 ounces of soap and stir until completely combined. NOTE: This is undiluted LabColor. We normally recommend diluting it, but Lane tested this recipe and found undiluted LabColors work best. If yours are diluted, you will need to add more to get the same color. Once the soap is the correct temperature (see note), spritz the purple soap with alcohol. Pour some of the clear soap into the purple soap slowly. 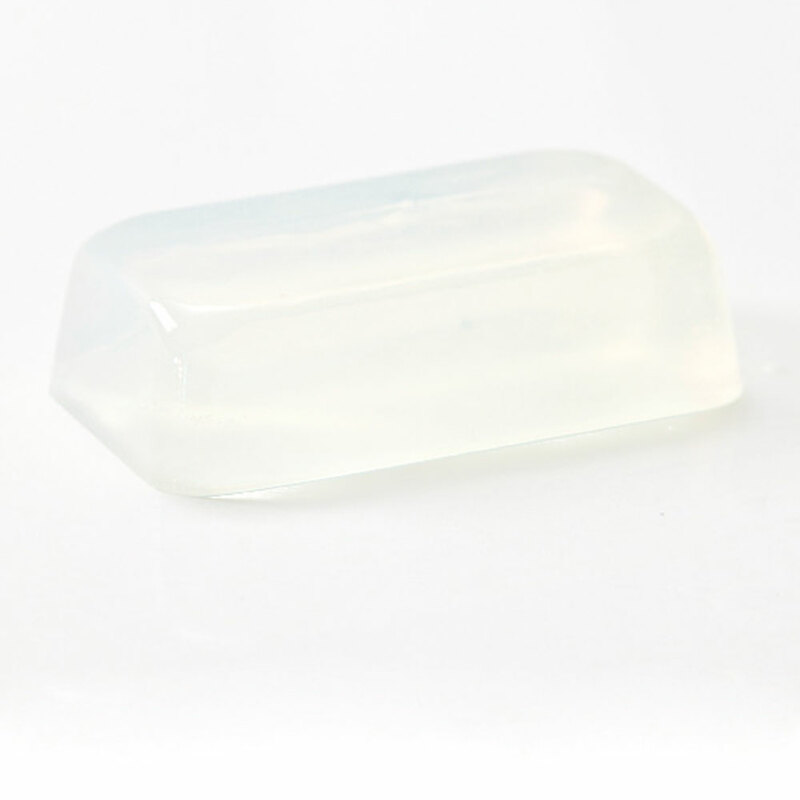 Reserve about 8 ounces of clear soap. Spritz with alcohol once more. NOTE: It’s very important at this point to keep track of temperatures. 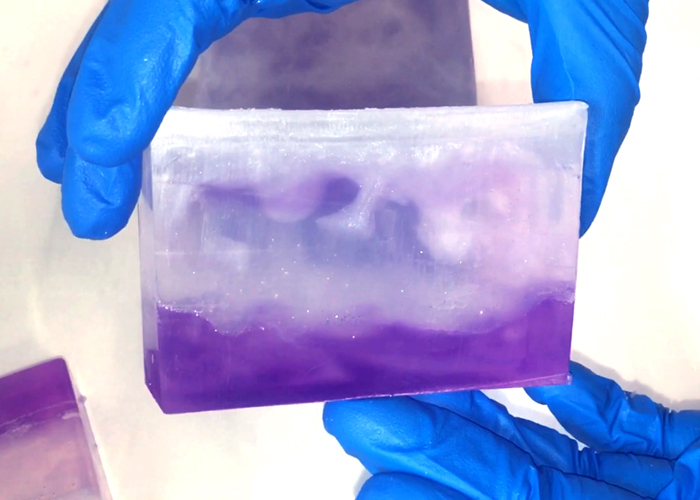 The idea is to have the clear soap warm enough to penetrate the purple soap that is already in the mold. The ideal temperature for the purple soap in the mold is around 120° F, and the ideal temperature for the clear soap in the bowl that you’re about to pour is around 135°. At this point, the remaining soap may have cooled and hardened. If so, heat up the soap in the microwave again for 20-30 seconds to make it fluid. 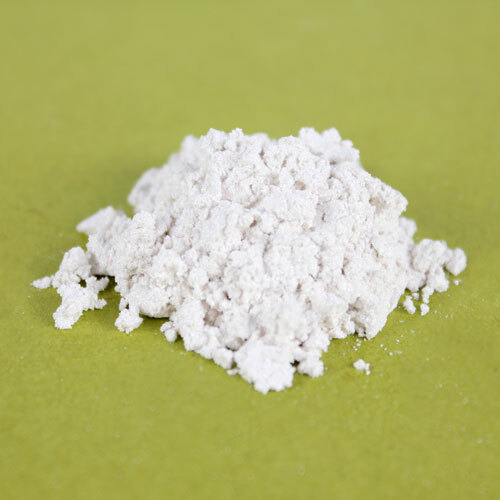 When it’s liquid again, add two .15 CC Mini Scoops of Super Pearly White Mica to the reserved clear melt and pour. After the soap has completely hardened, it’s time to cut. Remove the soap from the mold. Carefully cut the loaf into bars the width you’d like to cut your crystal point. 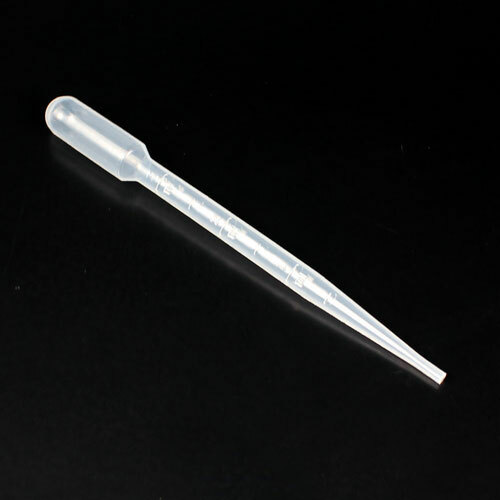 Vary the widths anywhere between .5″ and even up to 2″ (for large crystal points). Just give yourself variation for whatever size you decide. If you prefer large points, 1.5″ to 2″ slices work best. For the smaller points, create 0.5″ to 1″ slices. Sometimes I’ll even go as far as to slice a 0.5″ bar into a 0.25″ bar for teeny tiny crystal points. With the purple side up, slice the bar into even sections where the top edges look like a square. Very carefully, cut all four corners off of the section. On the corners you cut off, place the knife upward and diagonal, about ⅔ of the way up the section of soap, and very carefully cut the soap into a crystal shape on all four top corners. 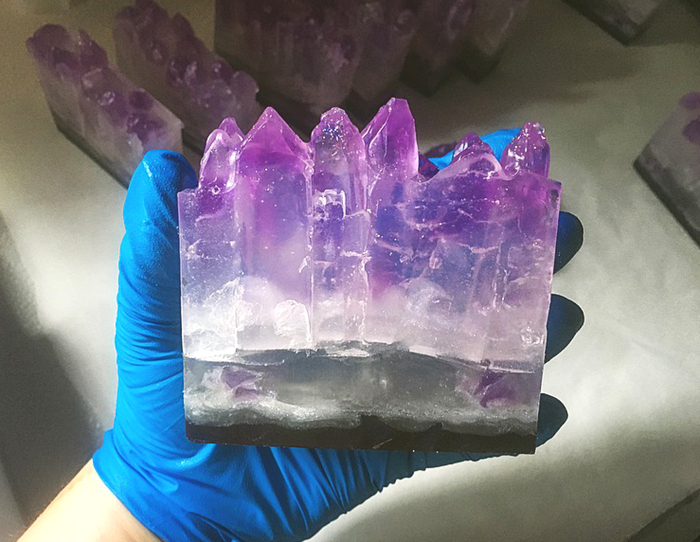 The soap should now look like like an amethyst crystal point. Do this repeatedly until all the bars are cut into into crystal point shapes! TIP: Keep the scraps and extra cuttings to use in later projects. They look like little amethyst chips, so hold onto them! Hi, I LOVE this project! However, you guys no longer carry the Tropical Purple Low pH LabColor. 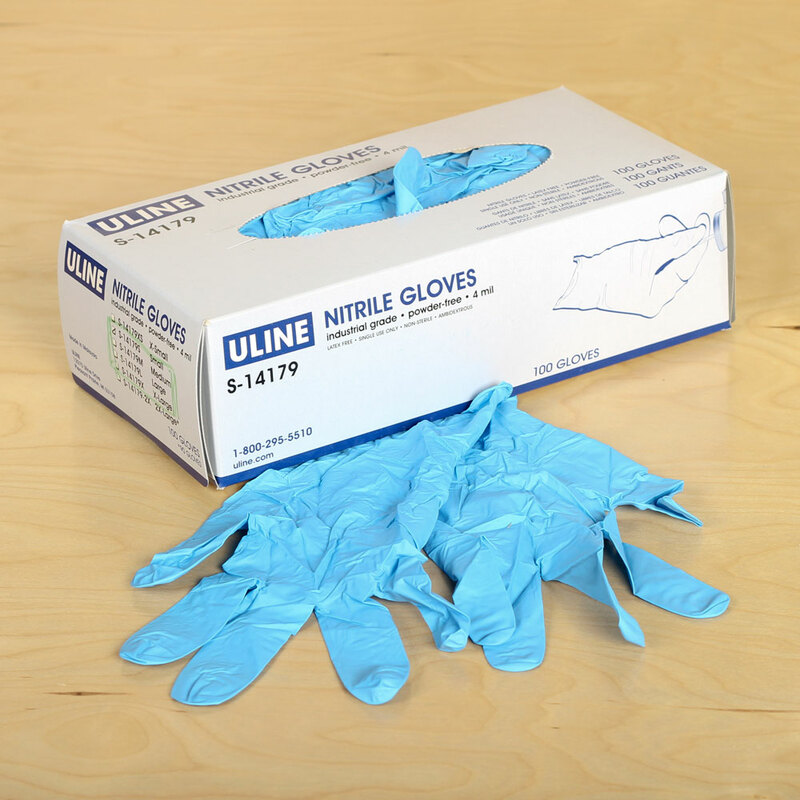 What is the closest substitute to it? 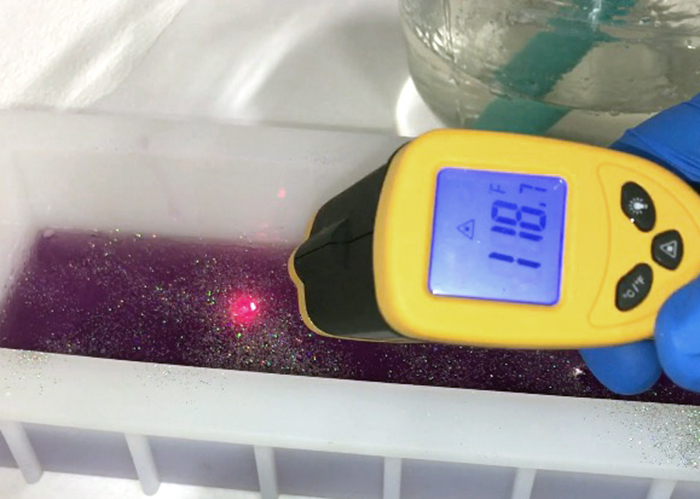 Regardless, my one comment is, I did not realize that the three drops of Tropical Purple Low pH LabColor is CLEARLY from the undiluted source. I used the indicated drops assuming a diluted stock and the result was very very light. So anyway, to anyone who might make this, keep that in mind (probably USE the diluted stock, but definitely use a lot more). That is our mistake, sorry about that Michelle. Thanks for letting us know. We got a note added to the blog post to make it more clear. Can we use the food colorant in this soap ? We don’t recommend food coloring because it can morph, bleed, or fade in soap. The LabColors and micas used in this tutorial work best. Can you use color blocks for this soap instead of the lab colors? Definitely. Although the Color Blocks may create a slightly more opaque appearance than the LabColors. But, I’m sure it would still look beautiful. Wow! This is absolutely amazing. I can’t wait to try to make this soap.